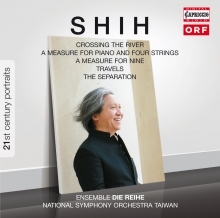 The Taiwanese-Austrian composer Shih was born in Taipei in 1950. At the age of 24 he moved to Vienna to study composition and the harp at the University of Music and Performing Arts. He graduated in 1983, was awarded the Austrian citizenship the following year and currently lives in Vienna as free-lance composer. In addition, he is actively mediating between European and Far Eastern musical culture even beyond his own compositional work. For example, as head of the Pacific Youth Orchestra Vienna, which has been founded by him, he brings together students of music from Taiwan, China and Japan. Shih’s very own mean of expression is sound, but it seems impossible to correlate his music with one of the traditional styles: his personal style, which sounds out all imaginable music-psychological processes and features an unparalleled variety of expressions, is way too individualistic. 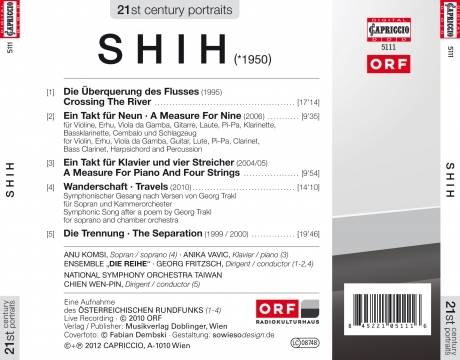 This exceptional style has its origin in the fusion of occidental music tradition and Far Eastern philosophy, which draws the attention from superficial effects to the subtle inner structure. With his work Shih wants to explore the depths of the human mind.